By the time this posts to my blog CM1 will officially be 21 years old. He was born at 9 AM and at that particular time, on his 21st birthday, he is quite happily sound asleep. On his actual birthday I was, for lack of a better description, slightly uncomfortable for awhile until my infant son made his appearance on the world scene. That was when I saw that face. Oy what a face! Do you remember the first time you held your children? It feels like just yesterday to me. Those beautiful big eyes full of promise and hope looking up at you as if to say "What the hell just happened? Oh and by the way HELLO." For CM1 turning 21 its no big deal. He really doesn't get to drink like any other typical young adult because of all the meds he is on. So no "out to dinner" where he can order in a restaurant his first glass of liquor. But for his birthday he was allowed one glass of Manishewitz. (We are obviously there to watch him.) That's right, Manishewitz malaga. Yes its ridiculously stereotypical that Jews don't know from wine vintages and choices, and that the only type they like is this thick grape sweet wine. But that is what he wanted. Me of course, I do know about wines and if I am going to indulge its not going to be fermented grape juice. 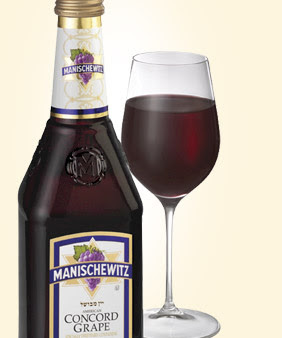 OK wine is fermented grape juice, but I choose a little fancier fermented grape juice with a bit of a kick. We typically celebrate birthdays in our house the night before. Hubby works such long hours that I always thought it unfair to make the boys wait until 9 at night to eat their birthday cake (the entire family finally being together ), so we party the eve of their birthday. Interestingly it was accepted very happily by the boys. I don't know if that was because, being Jewish, all our holidays begin the night before or because they get cake and presents a day early (Yeah I know, go with the present idea). We Jews call it EREV (meaning night of) put name of holiday here. So for the boys' birthdays, we just called it EREV whosever birthday. For hubby and myself we do it too. I suppose you would say that this is our family tradition. It's a nice tradition. I make a birthday dinner. What ever the celebrant wants. CM1 likes all different kinds of hors d'oeuvres; mozzarella sticks, little hotdogs, spanakopita, mini-egg rolls etc. Then we eat the all important fudgey, chocolatey birthday cake. But no singing. CM1 hates when people sing. Well he hates when we sing. Well he hates when I sing. He gets embarrassed too, when people sing happy birthday to him. He has never accepted being lauded for any reason and that includes birthdays. But he did make a wish and blew out the candles. Don't worry, I only put two candles on the cake . Could you imagine the fire hazard of 21 candles on a little six-inch cake. (No didn't buy a bigger one. We don't need cake for a week.) Oh and yes, I buy it from a bakery not bake it myself. There are many things you want to eat in this world, anything I baked is not one of them. I am a good cook. Baker not so much. (Ask me sometime about the birthday cake I once made for my father. After four hours in the oven it was still raw. And yes, the oven was turned on). It's interesting when you do take the time to look back and see how far your child has come. I do that on the boys' birthdays. This year CM1 is going to class on his own and working a small-part-time job on campus. He is helping build sets for the drama department and doing a little office work. He enjoys the wood working. He has always enjoyed working with his hands. He is very creative when given the chance. He even went to a club meeting this year. (Yes, we got him to join a club...Yeah) We tried to get him to join the Jewish Students Club. Thought there would be some similar interest with other students. He tried to get the members to involve themselves in what was going on politically (with Israel, the USA and the rest of the world) but they only want to have Sabbath dinner together and meet once a week. CM1 still doesn't get that most people are purely social animals. He doesn't understand that there doesn't need to be a purpose to getting together besides getting together. He has had enough of this group he said. He wants to do something productive he said. The para did tell me that the Rabbi who oversees the meetings seems to be a bit of a wet blanket. Not very much direction. I say at least CM1 tried. I mentioned to CM1 that since he is a history major maybe he should join the history club. Again they have interests in common, all being history majors (OK its another shot at group interaction). I also told him if he was truly concerned about world issues that he didn't have to just join organizations on campus. That there are many national organizations that he could join and involve himself. He didn't really go for the idea. I am sure it made him feel uneasy. A new social endeavor. New social structure. A new environment and a very unknown one at that. But eventually maybe he will think more about it and see what he can do outside the world of his college. That definitely is going to be one of his next goals besides trying to figure out just what he wants to do with his life of course. Meanwhile, CM1 still wants to save the world. He talks about it relentlessly in fact. (There are social justice groups on campus, but as usual they are very left-wing, very anti-Israel, very anti-American and not a place for CM1.) While he has said he doesn't want to go to law school, I challenge him to think how he could help the world without a law degree. He hates injustice. I mention to him that to fight injustice you just can't sit in a park in NYC and rail against the evils of the world and be taken seriously, no matter what some may think (especially if all you do is sleep on the ground, smoke weed, bang on drums, bathe in the local McDonald's sinks, believe you don't have to pay your bills and think everyone else's property and work product should belong to you simply because you exist). Eventually you really will be laughed at and dismissed. I explain to him that he needs to figure out exactly what his goal was and then we will figure out how he is to get there. If you are going to do battle, you need to be properly armed. If you want to fight the good fight, get the right education first. You may think you know everything once you graduate from college, but the world really isn't waiting on baited breath for you and your little bachelor's degree. But then again that is the wonder of being only 21 years old isn't it. You think you know everything and it gives you the strength to go try to change the world if you can. Now the truth that I have come to realize, on this my first-born's 21st birthday, is that in the end it is CM1 and only CM1 who will direct his future. We can only guide him. Help him figure it out. Provide him with the necessary support to achieve his goal. Yet only that 21 year old, 6 foot tall, 200 pound, very bright, socially aware and empathetic youngman can decide what he wants out of life. Only he can figure out his goals and only he can accomplish his life's mission. So as I look back over the past 21 years and relive all the ups and down and ins and outs, I realize that this has only been the preparatory stage for what is to come. In some ways everything has only been a beginning towards our goal of CM1 becoming the person he hopes to be someday. But I think the interesting thing about this particular birthday for me, is finally learning the fact that it is CM1 who alone, OK with some guidance, that will decide who he will eventually become and what kind of life he will lead. However, I am still voting for law school...(higher reasoning math is extremely painful for him so doctor and accountant are out)...hey, that is a Jewish-mother's prerogative afterall.